The PLAYM8 ® Parachute encourages co-operative, non-competitive play and re-enforces turn taking and sharing. The games are a lot of fun for children of all ages and abilities. A wide variety of different games can be played and beanbags and balls can be introduced to widen the activities. Six rainbow colours rather than the traditional four colours, and now with a hidden thick cord running all the way around the edge for extra secure grip for children and adults to hold on to when in use. Made from a light polyester/terylene/dacron material. Central mesh hole allowing free airflow without letting objects fall through. 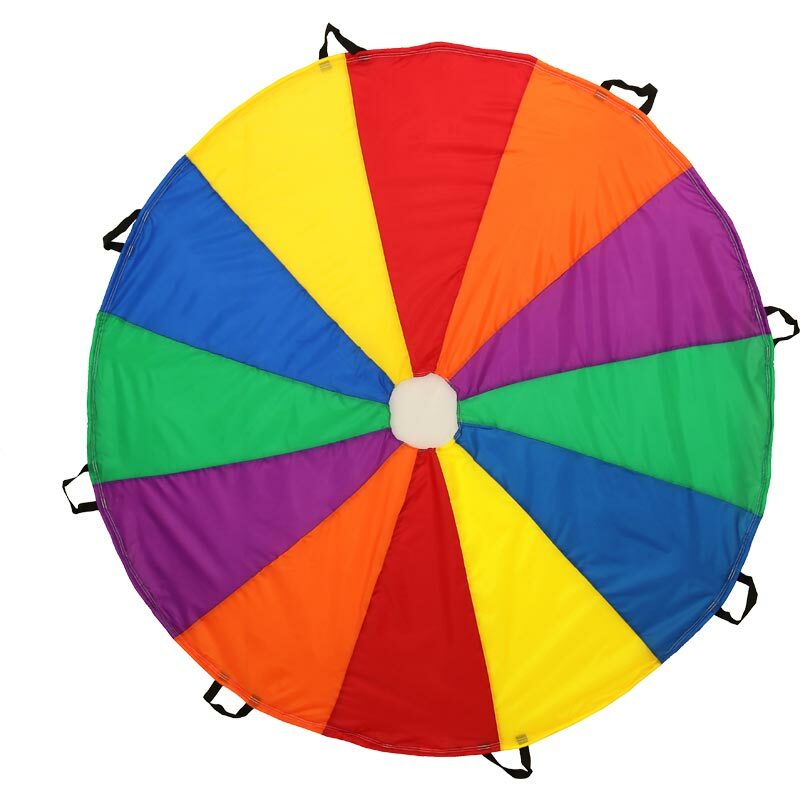 Each multi-coloured parachute incorporates handles around the edge of the canopy for easy grip. Available in diameter of 1.75m - 8 handles. Excellent service. Arrived very quickly. Parachute bright and colourful and of very good quality. Definitely value for money. Would highly recommend compared to other such parachutes on the market. Great quality and does what it says! Use it for my business and it lasts very well. Not a lot else to say about a parachute. 5 out of 5 6m Parachute Fabulous! Needed to enable lots of children of varying ages under 10 to play together at a church Family Fun day. This was a fabulous buy! The multiple colours shone with the sun on it and through it, the handles made it easy for small children to take part and the breather hole in the middle ensured no one was pulled over. 6m is very big so make sure you have the space with wriggle room around the outside. Well made and warmly recommended! I took out a 7m parachute to use as a games activity in a primary school in rural Kenya. It was a huge success, providing much laughter and excitement. It is strongly made and I have every confidence that it will be well used for several years! Very good quality, sturdy with beautiful colours. I use it for baby and toddler music lessons, children and parents love it! Folds away easily and comes with a bag, which is very handy! Great parachute used for our church Fun Day. Kids really enjoyed it. Good size and number of handles. Seems robust. Good price. Speedy delivery. I had no difficulties with the service Newitts provided regarding delivery of this product. The product however; failed to meet expectations when on the first use one of the handles tore away. Newitts customer services have been very prompt at dealing with this issue and a new one is being replaced. I look forward to trying out the replacement. Great quality for the price. Can be packed easily away in a little nylon bag - supplied with the parachute. The girls had great fun playing all the games. They can't wait until our next meeting to have more fun. This parachute seems to be of a very good quality. Has stood up well to enthusiastic use! Handy carry bag makes storing easy. We ordered this parachute for our Brownie unit. The absolutely love it, there are enough handles for them to have one each and enough space for the whole unit to join in. The parachute looks as though it has been made from good quality material which will hopefully be durable and long lasting. We have had many hours of fun so far and we hope to have many, many more. The service we received from Newitts was also great. The price was good and much cheaper than other places we had looked, the delivery price was cheap and the overall service we received was great, this included super fast delivery (2 days after dispatch) even though we only paid for standard. I would certainly order other products from Newitts after the service that I have received and would highly recommend them to anyone else. So far we have only used the parachute a couple of times but the children love the size and the fact there is enough room for all of our group. I purchased this product for my little boy's birthday party - it is really well made, and I love the colourful sections - am sure we will continue to use it for lots of fun games after his party too! Lovely colours, good quality handles/edging. Folds away easily. Light and easy for small children to play with. Only thing worth knowing is the nylon feel makes a lot of static energy and everyone's hair ends up standing up straight in the air when playing with it. Just adds immensely to the fun and hilarity for the kids. But adults might want to be aware they will emerge looking rather disheveled! Bought for 24 eager Beavers at our local Scout Group. Amazing! Everyone enjoying all the different games that is being used for. Many hours of fun ahead. Arrived swiftly & now being enjoyed by pre-school children near Cape Town where our daughter is volunteering in her Gap Year! Thank You. This Parachute is perfect for my children's classes love that it has 6 colours rather than the more normal 4, I went for the 3.5m one which is ideal for 12+ children although a bit small to play cat and mouse, life gards, with you need he 5m one for that. It's nicly made so think it will last a long time. We urgently needed a replacement parachute for a holiday club. The quality and strength of this parachutes is superb, especially the handles which can be a weak point. It folds up very easily with a velcro strap and stores away in a bag. I'm sure the whole thing will last for many years. I purchased a 6 meter parachute for my Brownie pack to use, they think it's brilliant and are looking forward to many hours of enjoyment . Great value for money , fast delivery and strong and hard wearing. It's been taken to an orphanage in India where they have been having the most marvellous time with it. I hope it stands up to the wear and tear of frequent use but we'll probably never know. Bought this parachute to use with children at Messy Church. It's ideal with lovely colours and a ventilated centre. Unfortunately the bag was damaged and had to be returned. Great parachute in lovely colours. Good standard of material. My brownie pack love playing parachute games and there is plenty of room for over 20 girls to participate plus the adult leaders . just what we were after, really strong, and great size. Used for a 5yr olds birthday party and they all had great fun, will definitely be using it for years to come. The parachute arrived quickly and in good condition. It was larger than I expected but great for larger childrens parties although could still be used for smaller parties if the adults joined in. Very bright and colourful and has been a hit with all the children. Great parachute, good size, hours and hours of fun. So many things to do with it from just flapping it with toddlers to colour matching counting, and 101 other things. This is the second one of these I have bought from this c0 , the first one withstood nearly two and a half years of weekly batterring by kids in preschools & nurseries I visit, and I couldn't reccommend this product more in terms of it's durability & pricepoint. Another added bonus is that unlike most other similar ones it has more colours than just the primaries, which is a nice visual bonus for small people. Bought for trip to Zambia to aid sports coaching and to leave out there for future use. Service from Newitts was great and parachute arrived promptly and well packed. Fantastic colours and strength of fabric, seams and handles. Packed small and light enough to transport within luggage restrictions. Fits about double the amount of children to handles with them holding onto corded edge and perfect size being big but not heavy to raise and lower. Great for lots of different team-building games and fun. Stitching on one side of parachute is slightly raised at seams(flat on other side). On the flat side a ball moves smoothly around the parachute. I had thought the slight ridges on the other side would hinder movement of a ball around the parachute but it turned out to be quite fun as it made the movement very slightly more unpredictable on that side which added to challenge and fun! Great parachute and very good value for money. We bought this to entertain a party of 15 roudy 4 year olds and it held up pretty well. It's good quality for the price with double stitching and a re-inforced edge and handles. Looks like it will last a while and the kids loved it. Much cheaper here than other places we looked too. Would recommend. I am very pleased with the size and quality of this product. I easily fitted 25 children around it to play games. 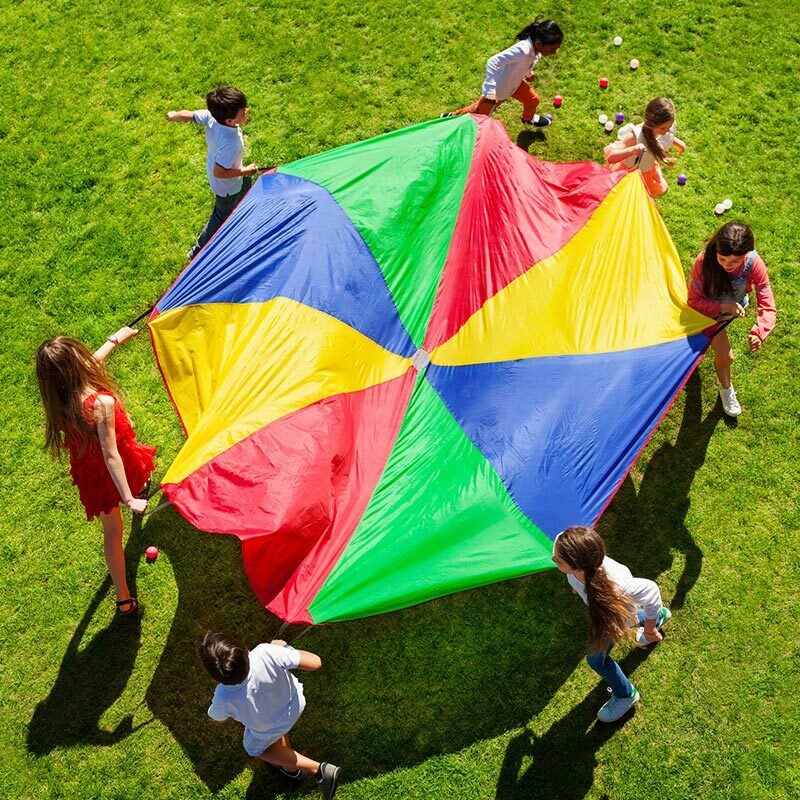 The parachute is fantastic, really good quality and great for larger groups of children. Needless to say, all of my children love it! Really sturdy & good quality parachute. I'm really pleased with it and I'm sure the children will be too! I would definitely recommend it. Brought 2 of the parachutes (different sizes), they are very well made, look & feel very strong, have used them in my TinyTalk classes already & they have gone down very well with the families, was recommeded by another TinyTalk teacher! Would buy again! I've used these parachutes in both, PE and Literacy/Numeracy Lessons, in school. I fancied one for my own family and it has been amazing fun so far! 5 out of 5 Fab Fun! I bought this for my son's 2nd birthday party , it was just the right size for toddlers and small enough to use inside but we will be playing with it outside in the summer too! Would definitely recommend and it's excellent value for money too! Bought for a children's group and used regularly. Well made and feel it could cope with all we throw at it. Excellent quality for the price. This parachute has travelled to Kenya and been donated to a mission team who will use it for play sessions in schools and Sunday schools in and around Nairobi. It is really sturdy and has already proved itself as a very popular item of play equipment. I highly recommend it as able to withstand far more hands around it than there were handles! 5 out of 5 9 metres of parachute fun! I needed a large play parachute at short notice and the largest I could find online was at Newitts. Not only was it large, it was also cheaper than smaller parachutes sold by other outlets. The reviews were good so I ordered one and it arrived within 36 hours. Since then, I've used it to run very successful parachute workshops in primary schools. I have it our ready as children come into the hall and it gives an immediate wow factor - it's so huge. The parachute is very well made with secure hold-handles and a strong perimeter cord in the lining. For price, value and quality, I'd definitely recommend this parachute. If you're interested in why I do parachute workshops: www.thinq-education.com. i work for captain fantastic children's entertainers, doing kids parties and a tots and toddlers groups, and i have had many parachutes in the past, which have torn easily and been useless after a month or so. But this is definitely the strongest parachute i've had. very good product! The parachute was of excellent quality and really well made.The grab handles are a good idea enabling people with physical disabilities to use it without difficulty.The delivery was speedy and the ordering system was easy to use. 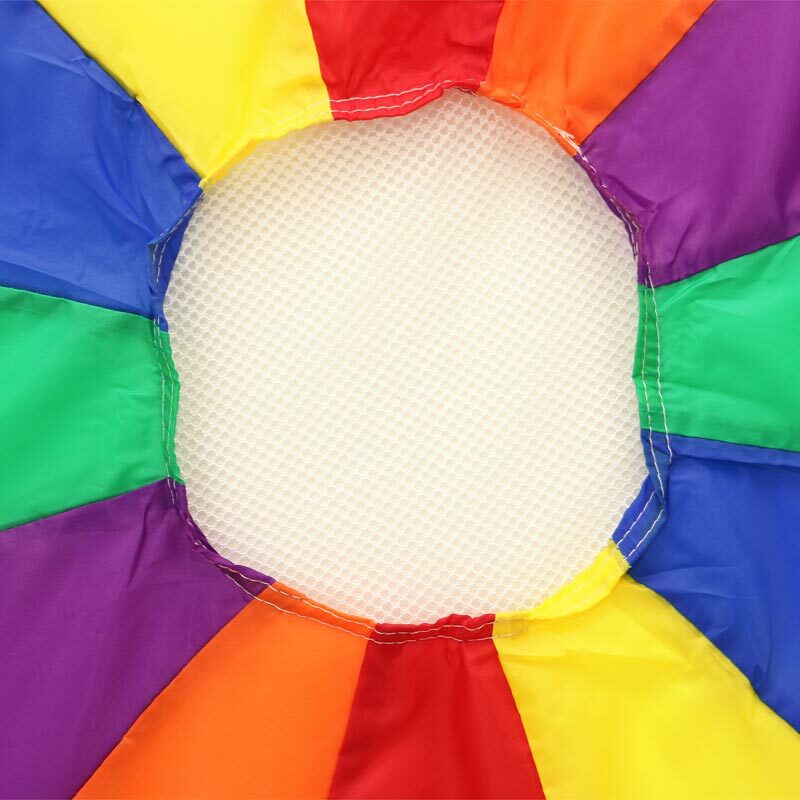 This enormous parachute (9m diametre) is fantastic for large groups of children and is very bright and colourful. I have used other parachutes which were much thinner and ripped easily, so I was pleasantly surprised by the quality especially since the price seemed so low for the size of the parachute. The play parachute was delivered very quickly and was a great product. We were very pleased with the servcie and the quality of the parachute. Was really pleased with this product when it arrived. The product looked exactly as in picture. I bought the 3.5m parachute with 12 handles. Prodect is suitable for up to 12 children. Was used for a group age range 4-6 and another group 10-14. Both groups had lots of fun! Parachute arrive the day after i ordered it, very fast delivery. I purchased a small parachute for use with my Sunday School group. I have lots of under fives in a fairly small room. This size is perfect with a small group and for use in exploring stories together as well as the usual things you do with a parachute. The bag was a nice size also so it went back in easily. Thank you for a good product. Glad I found your company. We are delighted with the quality, cost and size of this fantastic parachute - thank you, just what we wanted!